Driving Lessons Garforth, Driving Schools Garforth, Driving Instructors Garforth, Driving Courses Garforth. Why Choose '1st Car' ? Are all driving schools and lessons the same? Driving schools are different, don't think that passing your test with one driving school will take the same number of lessons as passing your driving test with another driving school. You should consider how qualified and how much experience your driving instructor/driving school has, the type of car might not suit you. Make sure you get on with your driving instructor, you will be spending some hours in the same car. Be aware that some driving schools do use a lot of trainee driving instructors and probably won't tell you when you book your lessons that you could be getting one of their trainees. 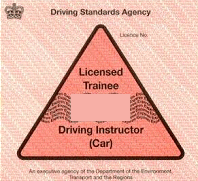 All professional driving instructors must display their licence to teach in the passenger side front window of the teaching car, trainee instructors will display a licence like the one below on the left and fully qualified instructors will display a licence similar to the green one dsiplayed below on the right. How do you get a provional licence ? Viewing and letting your driving instructor know your driving licence details. The Show me Tell me Questions. 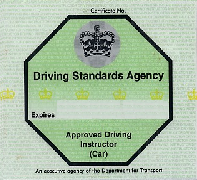 Driver and Vehicle Standards Agency. What is Pass Plus ? What Theory materials do you need ? Are all driving Schools the same ? Should you pass the theory test first ? Is it normal to feel nervous ? What car will you be driving ? Providing competitively priced and top quality driving Schools in Garforth| Aberford|Allerton Bywater| Barwick in Elmet| Colton| Crossgates| Fairburn| Halton| Kippax| Ledsham| Ledston| Micklefield| Rothwell| Roundhay| Scholes| Seacroft| Swillington| Whitkirk| Woodlesford. © 1st Car School of Motoring.